Why is the cafe so historically important and why is it such a scandal that so many are being allowed to die off unlamented? This was a fresh style moving on from the minimalist rigours of the Modernist movement. It represented a new vibrancy with materials like Formica, leatherette chrome and plastic coming to the fore. The 'streamlining' cult was especially evident in kitchen interiors and the functional spaces of cafes. The positivity of an age created new tastes and trends, with the cafe's Italian styling a ubiquitous cheery symbol of national regeneration and outward lookingness. But today you have to look harder than ever to find decent, intact cafes with classic Formica tables, lino floors, proper seats and small cabinets of biscuits and crusty rolls. Cafe family owners are nearing retirement age and the children don't want to take over the business. Also many leases are coming to an end for the central London cafes and the resale value of cafe buildings in the property boom is too vast to ignore. Too many have been replaced and refitted with ghastly plastic moulded interiors devoid of atmosphere. But those that are left are national treasures. The precursors to the original coffee houses were the monasteries and inns that had offered hospitality to travellers since the twelfth century. Expansion of urban populations during the fifteenth century led to a profusion of 'cook shops' - notably around London's Bread Street and East Cheap - where meal prices were controlled and the public could bring their own pies. The "first coffee house in Christendom" was established in Oxford in 1650 by a Jew called Jacob at the Angel in the parish of St Peter in the East. Two years later, a Greek servant named Pasqua Rosee (see illustration above) began running a coffee shop in St Michael's Alley, Cornhill in the City of London. 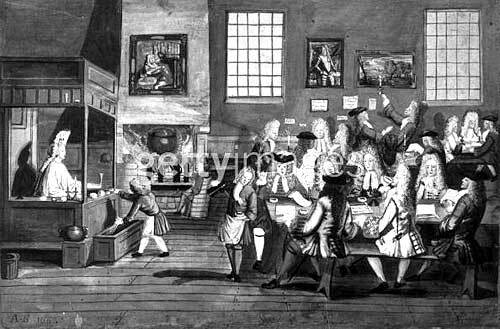 Coffee houses became such popular forums for discussion they were dubbed "penny universities". 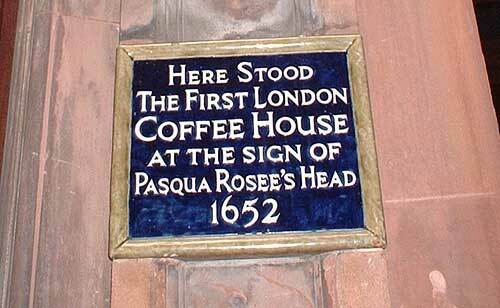 By 1670 the coffee house movement had overtaken - and become a key element of - Restoration London. By the 18th century, London was teeming with the liquid said to resemble 'syrup of soot or essence of old shoes' and places to drink it in. From 1675, a thousand or so coffee houses flowered during the reigns of Charles II, Queen Anne and George I. 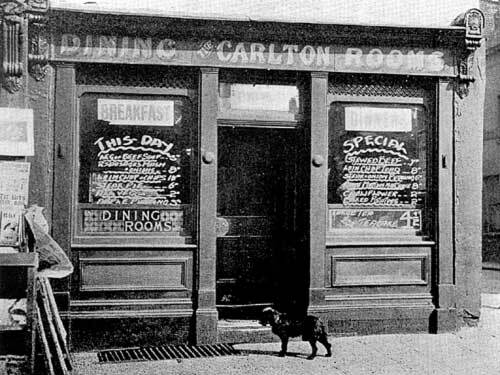 By the 19th century however, coffee houses had become exclusive clubs as a prolific press and an efficient post and transport system undermined the function of the coffee houses as centres of communication. England abandoned coffee as the demands of the East India Company to exchange its preferred stimulants pushed the domestic market into tea consumption. But due to the success of the Dutch navy in the Pacific, tea became fashionable in the Dutch capital. As the craze for all things oriental swept Europe, tea became part of the national way of life and Dutch inns provided the first restaurant tea service as guests were furnished with portable tea sets complete with heating unit. The first tea samples reached England between 1652 and 1654 and proved popular enough to replace ale as the national drink. Tea mania swept across England as it had earlier spread throughout France and Holland. Beginning in the late 1880's in both America and England, fine hotels began to offer tea service in tea rooms and tea courts. By 1910 hotels began to host afternoon tea dances as dance craze after dance craze swept the United States and England. The coffee taverns were largely overtaken in the 19th century by small establishments run mainly by Arabs, Turks, Greeks and Sicilians which had become the haunts of 'foreigners' as well as stray 'Bohemians'. Soho built on its traditional French, Italian and Spanish immigrant-centre origins as a new generations of outsiders move into London. After WW2 an influx of Italian families building on their long established catering expertise settled in Clerkenwell (Little Italy), spread West to Soho and eventually expanded all over the capital and the country. Gradually, as Britain pulled through the travails of the post-war economy London rejuvenated. The Festival of Britain in 1951 signals an unequivocal move forward. Somehow, this feat of mass cultural re-engineering would impel the arts in Britain for the following decade and a half. 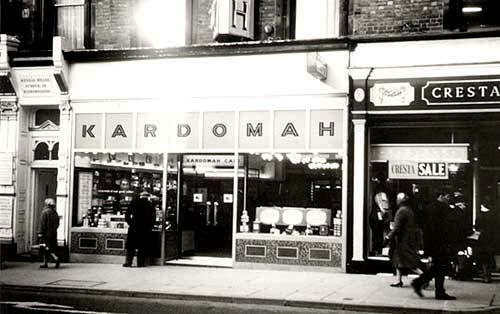 A greater informality of eating had begun as the first sandwich bar, Sandy's, opened in Oxendon St in 1933. Soon snack bars spread throughout the capital as the culture of fast-food was established. 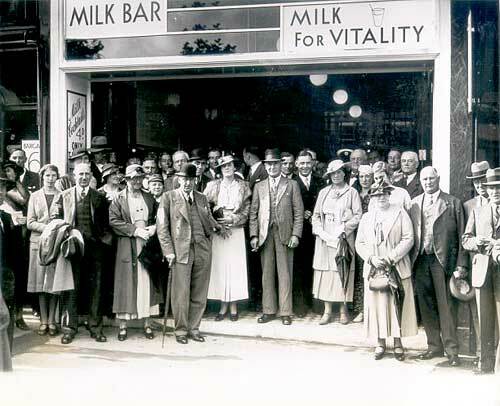 In 1935 the first milk bar is set up in Fleet St by an Australian, Hugh D. McIntosh. Within a year there are 420 throughout Britain. 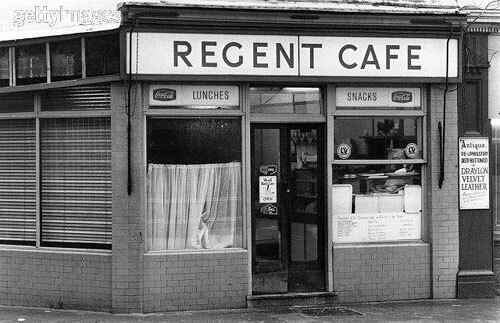 As a further twist on the theme, coffee bars with a reputation for low-life and fast times emerged to mainstream popularity in the 1950's. By 1953 coffee bars sprang up all over Soho. The first was The Moka espresso bar at 29 Frith St. Opened by Gina Lollabrigida, it became the model for many classic Formica cafes to come. In the 1970s, severe bust lead to a halving of the UK's manufacturing employment base. Large companies began leaving the capital en masse. Increasingly, British industry (for so long dependent on the spoils of Empire) fell behind the leaner economies of the US, Germany, Japan and Eastern Europe. Unemployment, virtually unknown in Britain in the 1950s, began a long spiral upwards, the subsequent recession accompanied by high inflation and a collapse in living standards. As proprietors found more profit in selling food, so the coffee bars gradually all turned into general cafes or cheap restaurants. Only a couple of die-hard cafe chains managed to last out the 1960s and hang on into the 1970s: the Lyons' Wimpy Bars (established in 1954) and the Golden Eggs (set up by Philip and Reggie Kaye in the early 1960s). The Wimpys avoided gimmickry, maintaining simple duo-tone minimal interiors but the Golden Egg was: "The most controversial use of colour in British restaurantswhere riotous colour schemes and brilliant opaline lights have brought a jazzy mood to eating in low-price popular restaurants."